Cal West-HMS has been working with Santa Clara County Real Estate Agents for many years. These strategic partnerships enable us to get to know some really innovative people and work together to service our home owner/investor needs in a unique way. Cal West does not specialize in real estate sales but we have spent over thirty years honing our skills in residential property management. If you are an agent we would like to introduce you to the Agent Referral Program. Here is how it works. Refer your client-Our partners in Real Estate often have clients that cannot afford to sell or have been relocated but want to maintain their residence as a rental. Often, real estate agents are managing properties on the side and need to free up time. Regardless of the reason, now referring your current or future clients is easy, safe and profitable. Referral Form-Fill out the referral form on this page and if your referral signs a management agreement we will pay a referral fee based on type of property, number of units, etc… We pay referral fees based on the Department of Real Estate guidelines. When the time comes to sell-Cal West-HMS does not make a living selling real estate and we honor all of our client relationships by informing our mutual clients to contact you when the time comes to list the property. We will not refer them to anyone else and we will not list the property ourselves. Thank you for your referral. We know that there are many property management companies to choose from. With so many options available and with your good name on the line we commit to making your client feel important. 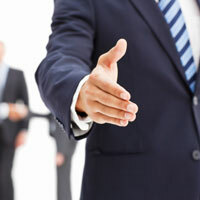 At Cal West-HMS we value each client relationship as well as our strategic partnerships. We look forward to getting to know you.